The University of Minnesota Golden Gophers football program is about to launch a new virtual reality app for recruiting purposes ahead of the Holiday Bowl, designed and created by FusionSports. College players today have grown up intertwined with digital devices and most have likely spent half of their life owning a smartphone. Head Coach Tracy Claeys is anything but tech-phobic and after meeting with Ashley DeWalt, CEO and founder of FusionSports, he gave the approval to create the platform based cinematic VR content aimed to provide GenZ aged recruits an inside look and live action shots at life on campus and around Minneapolis from the perspective of a student-athlete competing in the Big Ten Conference. The Sports Techie community blog caught up with DeWalt and chatted with Assistant Recruiting Coordinator, Morgan Liggett, because Director of Recruiting, Billy Glasscock, just had a baby, about expanding the UM brand and increasing relevance nationally as a top football program through this medium. Using VR as a storytelling experience is catching on in business, entertainment and sports, a trend the Gophers are adding to their digital sport portfolio with the help of a leading marketing agency and cutting edge tech as a way of showing prospects daily activities through a custom mobile application. The app should be ready by the kickoff time of 6 p.m. on December 27 when UM (8-4, 5-4 in Big Ten) takes on the Cougars (8-4, 7-2 in Pac-12) in San Diego at the National Funding Holiday Bowl at Qualcomm Stadium, and televised on ESPN. This sports tech is nothing short of greatness. University of Minnesota Football Virtual Reality Recruiting App By Fusion Sports – SportsTechie blog. FusionSports is a leader in capturing behind-the- scenes virtual footage. At Minnesota, they took three days to film a typical opening day gameday experience against Oregon State at TCF Bank Stadium, practices, workouts, the locker room and film room, as well as other campus experiences like tailgating and Athletes Village, in addition to life in the big city at local St Paul neighborhoods and the beach at Lake Calhoun in the land of 10,000 lakes. DeWalt was impressed by the trophy room and banners highlighting legends like Bronislau “Bronko” Nagurski among others. 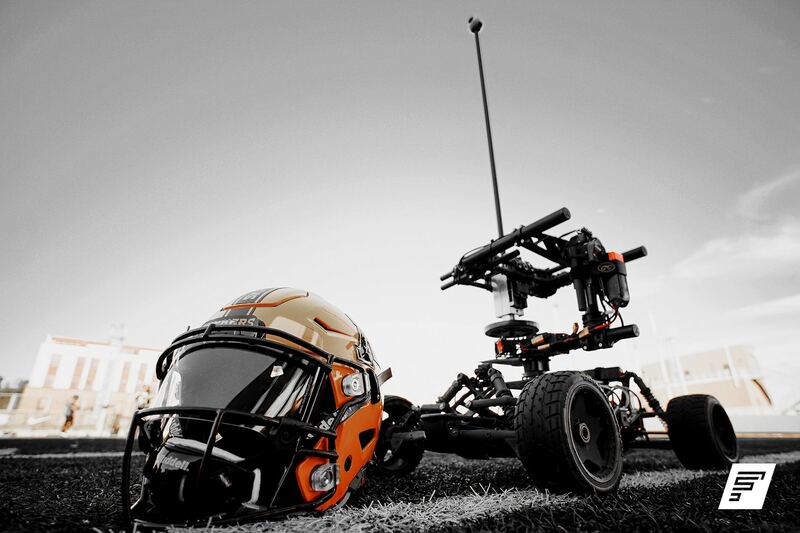 A combination of proprietary camera technologies and rigs, customized drones and a remote controlled car with a stabilizer feature were all used to capture the nuances of the weight room, the thrill of cheering on skydiving cameramen filming at the home opener, the boisterous student section, entertaining band, and more. Coach Claeys is tech savvy since his days at Northern Illinois University and uses his iPhone and iPad to stay active on Twitter by posting and sending DMs. Claeys understands the value of aligning his football program with innovative sports technologies as a way of differentiating from other collegiate athletic programs in the BIG10 conference and around the nation. The University of Michigan became the first rival program to utilize VR yet their landing page has nothing more than video and photos, according to DeWalt. Immersive VR Content on Mobile App to Give Football Program an Edge in Recruiting Efforts. 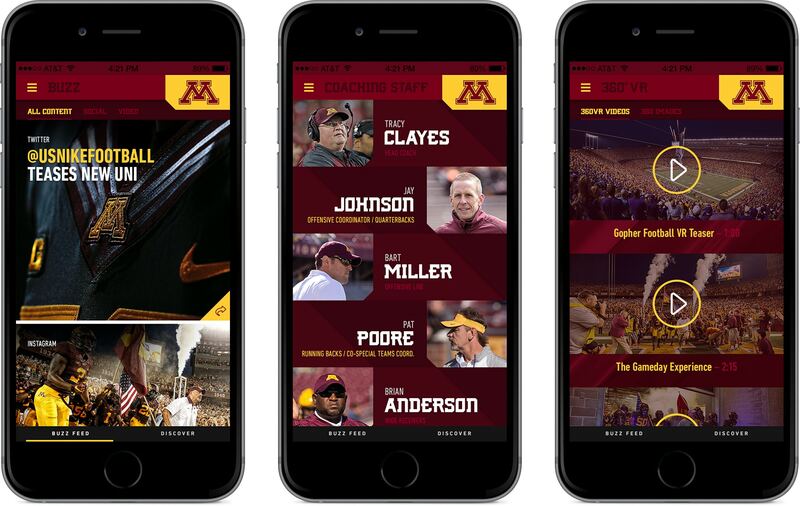 FusionSports designed the Gophers VR app Brick By Brick landing page to be more robust and immediately direct recruits to download the app from google play or the app store as an initial call to action. On the first page, recruits, fans and alumni can engage with the Buzz feed Gopher Gridiron social media platform consisting of Instagram, Twitter and Facebook page feeds, and the Discover tab packed with news, stories and custom videos. Launch to the 360 VR video and images. Read up on coaches bios. Look over highlights of custom Nike Swag that includes travel gear kids love like uniforms and cleats, as well as Schutt and Riddell helmets. Push notifications are another key feature of the application. Updates will occur 3-4 times weekly provided by the recruiting staff of five. App content and graphics are produced in-house by the department. Money to produce the app comes out of the recruiting budget. Peruse the content from home, at school or work by downloading the free app and using a pair of Google cardboard glasses or other popular VR headsets such as Oculus Rift and Samsung Gear VR goggles. 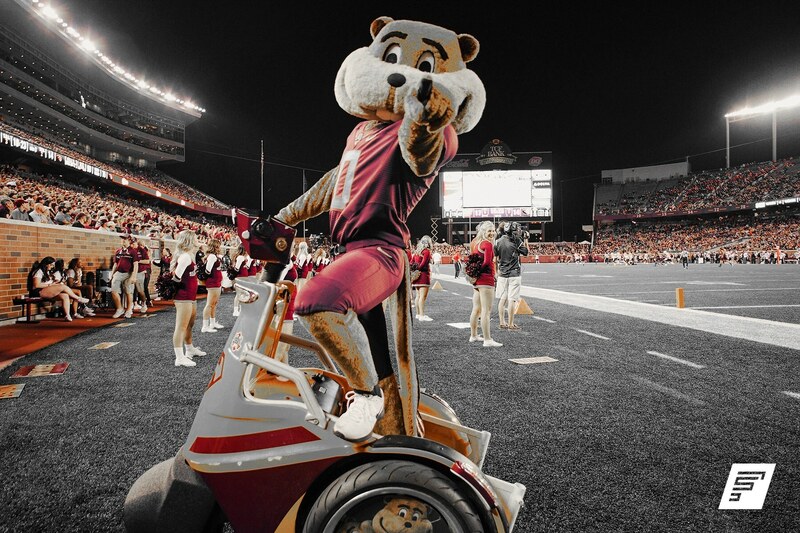 Goldy Gopher On A Segway Chariot Captured On VR By FusionSports. Ashley explained about their business relationship with the University of Maryland and the highly successful ‘Maryland Pride’ campaign. It truly was a movement that went viral because of a combination of the website, app and social media campaign. Under Armour founder Kevin Plank is a proud alumni and used his company to assist pushing content throughout the campaign. Maryland is a testing ground for prototype UA equipment, shoes and wearables, a sports tech-driven message DeWalt included in marketing the program. Since 2006, FusionSports has pushed the envelope together with top sports brand partners to assist with the telling of their story via social, digital and now virtual reality experiences. The FusionSports team of five is a passionate collective of former athletes, marketing thought leaders, storytellers, strategists, and designers dedicated to creating the most meaningful branding experiences. DeWalt is a new Father himself and will take this holiday downtime to start planning the scaling of products and services, and additional hiring in 2017. He tells me they often win bids against bigger companies because of lower overhead. Minnesota Golden Gophers Virtual Reality (VR) Football Recruiting App. Sports Techie, the novel vision being executed by Coach Claeys of reinventing the football program as a tech friendly brand is augmented by the immersive, cinematic experience of VR. Will this give the University of Minnesota football program a competitive advantage and entice recruits to visit the campus in person and, ultimately, become a Golden Gopher? I believe so. Liggett says he mentioned to recruits, “There are twenty Fortune 500 companies in the area making it a pipeline to jobs. The UM is also a top 25 university with half a million alumni living around the world.” It was founded in 1882, making the program one of the oldest in college football. The future has never looked brighter. Five full-time strength staff members are users of the Catapult GPS tracking system adding to the rich sports tech image of the program. I mentioned to Liggett the team might want to solicit an official sponsor and partner of the technology component of the program. For example, UM Football Sports Tech Presented by FireFly Computers, has a nice ring to it. Besides Michigan, Oklahoma State is another college football program that has dipped into VR for recruiting. I recommend WSU Head Coach Mike Leach, UW Head Coach Chris Peterson, Georgia Head Coach Kirby Smart, and Georgia Tech Head Coach Paul Johnson, and any other college sports program to all call FusionSports about VR needs. A few items I found noticeable missing from this version of the app include SnapChat content. Liggett says the program has a SnapChat handle and the assistants use it. I might have added additional information about the cheerleaders, cheer squads and student body. Recruits certainly want to know more about what daily life is like in the dorms, at the cafeterias and inside the classrooms, especially during finals week. I would also add a stats and analytics page. The indoor practice facility is not covered in this version of the app because it is undergoing a $200 million facility upgrade however it will be ready to showcase how training is conducted at different times of the year by the Fall of 2017. No doubt, this VR app will provide UM football a recruiting competitive edge and add to their brand image. I look forward to using the iOS application during the upcoming Holiday Bowl and beyond. The testing mode is about complete, the last step is to submit to the App Store and then it will be ready for all. 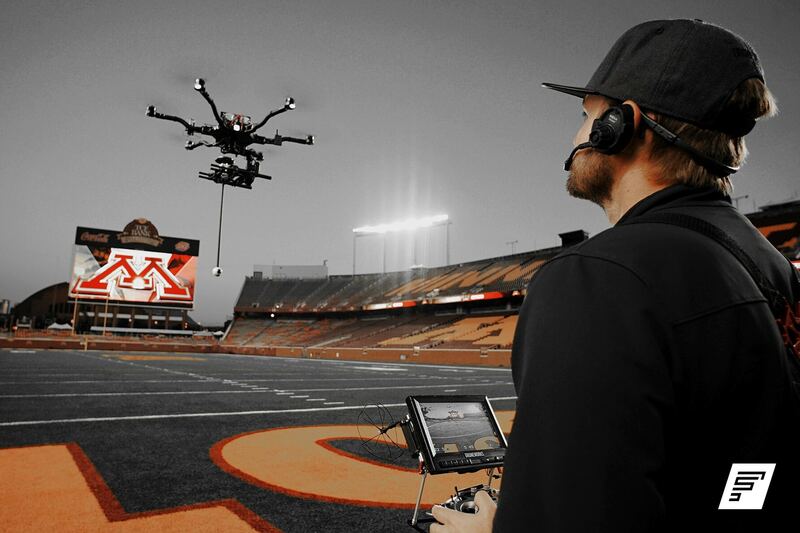 Thank you to the University of Minnesota football team for sharing this sports tech story with Sports Techie.